I just finished watching the third season premiere of Hannibal, and it has taken me about fifteen minutes to aptly digest what I just saw. If you were a fan of the show’s alternative approach to a police procedural, then you may want to adjust your brain before tuning in. The way that the first episode of this season played out, I’m not sure we are going to get a case-a week with death tableaus. I honestly don’t know where or which way that this will go. I do remember thinking that there were familiar things from perhaps the third book, Hannibal, by Richard Harris (the only one I actually read). I could be wrong here, but I believe that the show runners are merging storylines and kind of doing their own thing with the story here and I love it. The violence is almost artistic in its displays of slow motion and extreme colors. The scenery plays a very different role as well. Everything is aesthetically pleasing, and I think that’s super intentional. Maybe we are seeing things in Hannibal’s eyes or his point of view. Anyway, after nearly eviscerating everyone else on the show last season, Hannibal (Mads Mikkelsen, in possibly the BEST portrayal of the famed doctor to date) seems very relaxed and in control already in his new surroundings. Gillian Anderson is also back as Hannibal’s psychiatrist/colleague/weird female friend and she is brilliant. I read an article with the show runner saying that this is the season where he got to make the show he’s always wanted to make. So, I intend on strapping in and enjoying the thrill ride. 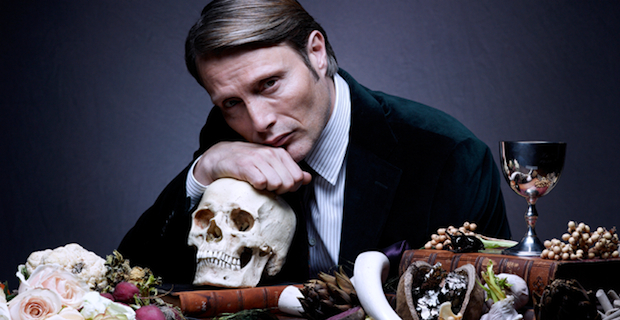 Hannibal airs Thursdays at 10 pm Eastern on NBC.